US Service Animals - Service Animal Laws in New York | What Are The Rules? The definition of a service animal is the same across America. The law states a service animal is trained individually to work and perform tasks for someone who has a disability. Service animals can do a number of tasks and work directly for their owner, tailoring their assistance to the needs of their owner’s disability. For example, service animals can sense when someone is going to or is having a seizure or they can fetch medication for their owner. It is what particular animals are classed as a service animal and how they are accepted into everyday life with their owner that changes throughout the State laws that differ. The laws in New York differ in some ways to the American’s with Disabilities Act which serves as the overarching law for America. States are allowed to have their own laws that are either the same, similar or different to the ADA. In New York anyone with a disability can rely on the support from a service dog to help them live, work, go to school, go to college, travel or anything else they wish to do. The American federal law states that a service animal has to be a dog or a miniature horse, however, New York State law does not have a definition in place for a service animal. This being said, it is advised to have a service dog or service miniature horse because they are the best animals to train, behave as service animals and have been chosen by law for this reason. The commonality between the New York service animal laws and the American’s with Disabilities Act is that service dogs are permitted in all public accommodations. Public accommodations are any public places that the general public are allowed access to. The New York law follows the same protocols and regulations as the American’s with Disabilities Act to allow a person with a disability access to all public spaces with their service animal. Access to public accommodations and facilities includes restaurants, museums, shops, public transport as well as anywhere else the general public is allowed access to. All service dogs should be under control of its handler either by a harness, tether or voice commands (in certain situations where a harness would interfere with its work duties). In comparison to the ADA, the New York law covers the definition of public accommodations very broadly and includes all public and private housing, all public and private transportation, all schools and educations institutions, all buildings where the public is invited to enter (including government buildings), all theatres including music venues and cinema, all places that sell food and beverages and all other places of public accommodations, entertainment, shops or businesses where the public is permitted. If a service animal causes a threat to the health or safety of others then a public accommodation can deny access. This could be if a service dog is growling or barking at others and out of control. However, this is very unlikely because service dogs are trained extensively to perform their tasks and support their owner in busy situations. A public accommodation is not required to allow your service animal to remain if it poses a direct threat to the health or safety of others. If, for example, your service dog is growling and lunging at other patrons, and you are unable to stop the behavior, the dog might have to leave. For transportation, service animals are permitted in all private and public transportation including vehicles and facilities. One of the most important reasons for a disabled person to have a more independent life so accessing public transport with their service dog should always be permitted. Transportation includes ferry, metro, train, bus, taxi, and other ground transportation. Dogs are specifically trained to work alongside their owner, support them when needed and be by their side in all environments, including new transportation. 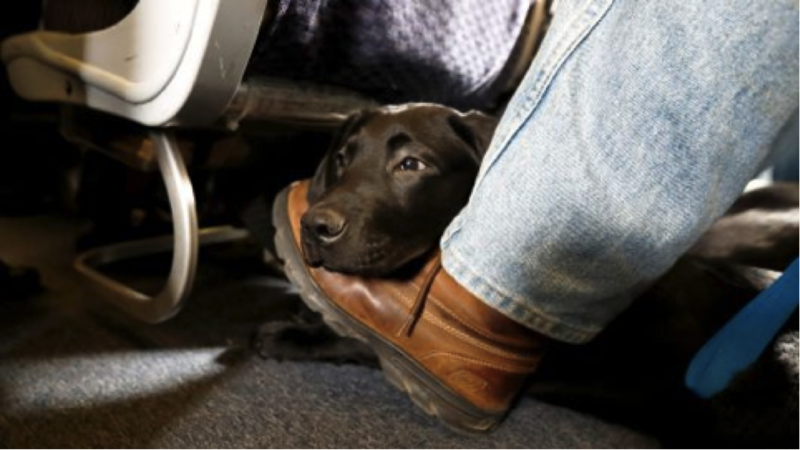 Airlines have also allowed the use of service animals (dogs and miniature horses) and under the Air Carrier Access Act (ACAA), airlines cannot discriminate against people with disabilities. For taxis in New York City, a big business, the taxi, and limousine commission has rules to ensure there is no discrimination against someone wanting to take a taxi ride who has a service animal. A law that has been recently passed in New York State (December 2017) covers service dog fraud. The misrepresentation of a service dog is a common crime where an owner of a dog affixes the wrong tag to them. For example, calling an untrained pet dog, a service dog to let them go into shops and restaurants. Violating this law could result in up to $100 fine and 15 days in jail. This a move in the right direction to ensure that all service animals are treated with respect and ensure that only the people who need the support of a service dog, get it.